Fahrenheit 11/9 - Upstate Films, Ltd.
Michael Moore’s FAHRENHEIT 11/9 is a provocative and comedic look at the times in which we live, exploring two questions about the Trump Era: How did we get here, and how do we get out? 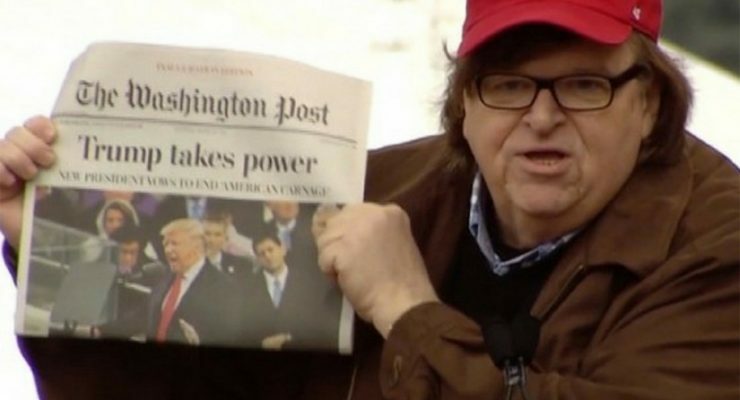 “In July 2016, Michael Moore was treated like a crackpot doomsayer for writing the essay ‘5 Reasons Why Trump Will Win.’ His prediction was the opposite of most pollsters and pundits but it came true in the wee hours of November 9, 2016 when the electoral college votes were tallied. Now Moore brings his sharp satire to analyze the legacy of 11/9 and to raise questions about what lies ahead. Trump is a master distractor with his incendiary tweets, staff firings, and outright lies. But within the chaos, his administration has delivered on a right-wing agenda with tax cuts for the wealthy, environmental deregulation, court appointments, and treaty withdrawals that will be felt long into the future. In Moore’s three decades of filmmaking, he’s often voiced progressive ideas that sound radical at first but eventually become mainstream. His most famous work, Fahrenheit 9/11 – named for another infamous date – decried the US’s war in Iraq long before it became widely derided. A similar dynamic runs through Roger & Me on America’s loss of industry, Bowling for Columbine on gun control, and Sicko on health care.